This year's volume of the Comparative Law Yearbook of International Business deals with the subject of product liability law. This is a growing area in which manufacturers and supplies are finding themselves more and more responsible for the quality of their products and for the consequences flowing from any defect therein. This book discusses a wide variety of topics which come under the umbrella of product liability, ranging from liability for injuries caused by the use of asbestos and other toxic substances to the responsibility of air carriers in hijack situations. There is a growing amount of litigation throughout the world tackling the problems arising from the safety of products. These laws take into account te manufacturing process, the transportation, storage and delivery of goods, the intended use of products, their fitness for such purpose, and any warnings or instructions as to use given to consumers and end users. This publication also covers the question of jurisdiction in product-related litigation, particulary in crossborder transactions. In many instances, a plaintiff will attempt to bring his action in the United States due to the large amount of damages, especially punitive damages, awarded there by juries in civil actions. Defendants, on the other hand, seek to counter this by raising issues such forum non conveniens. There also is the question of state versus federal jurisdiction within the United States, as well as a discussion focusing on the possible growth of federalism within the European Union and its impact upon product liability nationally and at a European level. A comparison of the divergent cultural attitudes towards property in China and the United States, including the different emphases placed upon the ownership and role of property in society, demonstrates the different views of product liability. Another aspect of defective goods dealt with here is liability for the recall of a dangerous product. There is a chain of responsibility stretching from the manufacturer, trough various levels of suppliers, to the final retailer of goods, which is obviously important when attempting to remove dangerous products from the market as quickly as possible before they can cause widespread injury to consumers. This has been shown to be particularly relevant in cases involving automobiles and food products. 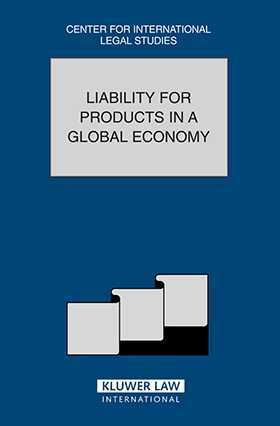 Overall, therefore, product liability law is a vital part of the general law protecting consumers, both on a national and international basis, which makes this book a very interesting and useful read for anyone involved in this area.